ABOUT 80 people took part in a charity cycle through the countryside around Henley. The riders were taking part in the seventh annual PIP Mountain Bike Challenge, which started and finished at Lovibonds Brewery in Market Place. They tackled the 20-mile off-road course passing through Lambridge Woods, Nettlebed, Maidensgrove and the Warburg Nature Reserve on Saturday (13). All the money raised will benefit Pursuing Independent Paths, a charity based in London that supports adults with learning disabilities. The event is run by Bill Feeney, who lives in Queen Street and is a director of the charity. He was unable to ride this year after breaking his shoulder and collar bone a few weeks ago but Henley Mayor Glen Lambert stepped in to ride in his place. Other riders included Matt Richardson and Victoria Morgan, from Henley, who dressed up and rode Raleigh choppers along the route. After riders finished they gathered at Lovibonds for refreshments, provided by the brewery and Bosley Patch market garden in Marlow Road. 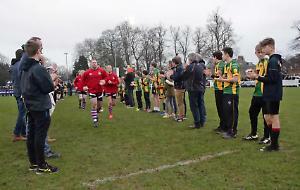 For a full report and pictures, see this Friday’s Henley Standard.